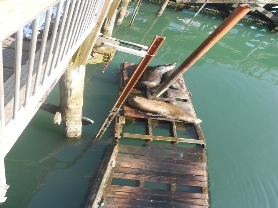 The wooden sea lion docks at Port Dock One on Newport’s Bay Front have provided a haul-out for sea lions for over 18 years. They provide a unique opportunity for the public to observe these amusing and interesting animals close up. For many, this is the quintessential Newport experiences, and we thank the Port of Newport for their co-operation in allowing public access, and their past help in maintaining the docks. Three winters ago, storms destroyed the docks. The foundation was formed to raise the funds for, and organize, the repair, replacement and ongoing maintenance of the docks. Later, will also provide an observation deck that will separate the public from vehicles servicing fishing boats at the dock. We have put in the new floating docks and the pilings for the viewing platform. All that is left now is for us to manufacture and install the actual platform, which we hope to do shortly. 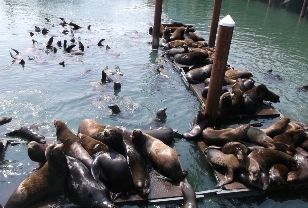 OUR MISSION:To raise the funds for, and to organize, the repair, replacement and ongoing maintenance of the Sea Lion Docks on the Newport Bay Front, and to improve the safety of people viewing the sea lions from Port Dock 1. 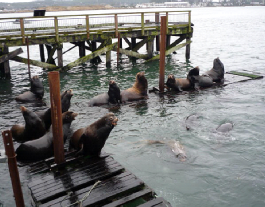 Using the Steve Brown isolation cage moored to the docks, marine biologists are able to isolate and then treat injured sea lions, such as this one which had been snagged by a plastic packing band. Steve was the local veterinarian and the driving force behind the development and use of the cage. Last year ........ Almost gone!